Best Perogy Recipies - traditional and new ways to prepare perogies. What is the “BEST” perogy recipe? 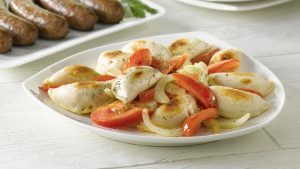 Mmmmm … perogies, perogy recipes! Whether you are a traditionalist and only eat your perogies boiled and topped with bacon, onins, and sour cream, — or you are a little more adventurous and like pizza perogies barbequed crispy and dipped with salsa and sour cream, perogies have become a Canadian staple food, and most people have a favourite way to consume these delicious dumplings. The traditional certainly are delicious, but don’t be afraid to try some new ways to serve perogies, and vary your weekly meal options. As far as the “best” perogy recipe… read on. So what is the BEST recipe for perogies? Well, if you are looking to make your own perogies, be prepared to roll up your sleeves, break out the basic ingredients and spend a few hours of fun making perogies. The recipe itself is fairly basic, and to be honest, the BEST recipe will depend on who you ask? Many of us have family recipes passed down to us for the simple dough recipes, as well as favourite filling recipes, and if you get the right people in a room you will have some pretty passionate discussions about who has the best perogy recipe. The basics for any traditional perogy recipe are flour, water, oil, salt, eggs, and the the filling ingredients which may include potatoes, cheddar cheese, cottage cheese, onions, green onions, dill, blueberries, and and number of other fillings. Below you will find one of the best perogy recipes for traditional potato and cheddar cheese perogies.